Well, it seems while Samsung is only doing betas for Android 8.0 Oreo on the Galaxy S8, it also has a couple of Oreo test builds for the Galaxy Note 8, at least for the unlocked Snapdragon-powered Note 8 in the US. Someone has managed to grab an Android 8.0 OTA for Samsung’s latest Note flagship and has posted links for it to Reddit for all to see and try out. As expected, it’s not a stable or final build, but it seems to be working well enough as a trial firmware. The leaked OTA requires the device to be on firmware version N950USQS2BQK2, which is the latest official build and only available for unlocked Note 8 units on Verizon at this point. However, to get around that limitation, any unlocked Note 8 owner can get the N950USQS2BQK2 firmware on their device by following the upgrade path suggested by the Reddit user. Also, this is only for the Snapdragon-powered Galaxy Note 8 in the US, if that wasn’t clear already. Naturally, we don’t support flashing unofficial software unless it comes directly from Samsung as part of a beta test program, so you’re on your own and would require some knowledge of flashing firmware (both via a PC and through the phone’s recovery mode) if you decide to try this out. What we can suggest is looking at a few step-by-step guides that seem to be making the rounds online with directions for installing the leaked Oreo build. We would also suggest making a proper backup of your Note 8 via Samsung Smart Switch (or any of your favorite backup apps) before trying the test Oreo firmware, as you may have to wipe all your phone’s data (including images and other files on the internal storage). And, if you do install it, let us know how it works! To see what features Oreo is bringing to the Galaxy S8, check out our exhaustive What’s New With Android 8.0 Oreo series, which should apply to the Note 8 as well. 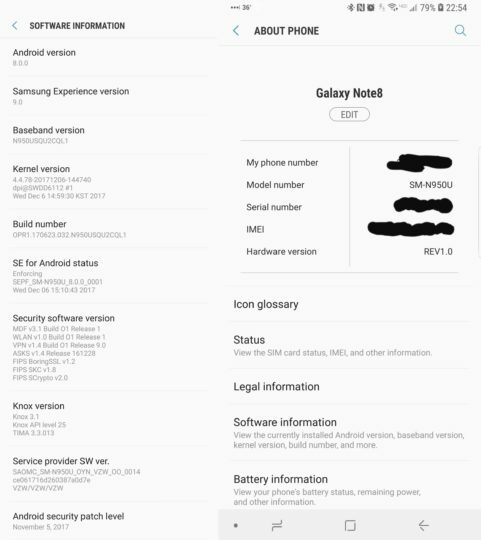 I like Samsung devices…but, Exynos Note8 doesn’t have Oreo at this time (4 on March) and there still no real news about when it will roll out…paying 1000€ for a phone that is not UP TO DATE out the box is making me re-think if i ll be buying Samsung again…i simply hate their update policy. Anyone tried this version as of yet? I really hope Samsung would treat us with Oreo by New Year’s eve!